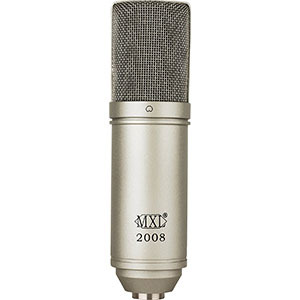 Condenser microphones are often times looked upon as a very exclusive category. The general idea is that you have to spend large amounts of money in order to get one that is even remotely decent. As it turns out, that isn’t the case. Back in the day it was unthinkable to purchase an affordable condenser, but it isn’t any longer. Today we’re going to show you some of the best condenser microphones you can find under $50. Some of these are arguably among the best microphones you can get in general. Afterward we’ll discuss pros and cons of this category. Very decent build quality coming from such a budget model. Simple but effective cardioid pattern that eliminates noise quite well. Features a great set of accessories, including a shock mount. Recording acoustic instruments leaves a bit to be wished for. Marantz is one of those brands who truly love to explore just how much performance they can squeeze out of a budget platform. Their Marantz Professional MPM 1000 condenser is probably one of the most impressive cheap condensers you will find on the market. Marantz went with a balanced set of features none of which are compromising the core performance. After all, if you have good core performance that on its own is impressive in this price range. 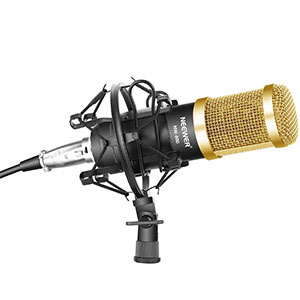 With its solid chassis, a fairly decent diaphragm and a more than acceptable frequency response range of 20Hz to 20kHz, Marantz Professional MPM 1000 is a good choice for absolute beginners and those who want to get to know the condenser microphone. It is a durable and well built workhorse that delivers. Great cardioid pattern which allows it to be pretty efficient. Ability to record a variety of instruments with great quality. If you really think about it, Nady CM-88 shows us just how far the industry has come. This is a small diaphragm condenser, or a ‘pencil condenser’ designed primarily for recording of instruments. Having a package such as this one, that works well at such an attractive price truly wasn’t possible not so long ago. It doesn’t get much better. Nady has packed this bad boy into a pretty sturdy chassis making it ideal for semi professional use. 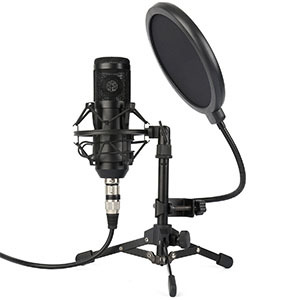 Its modified cardioid pattern allows use this mic for a variety of applications. These even include recording of cymbals and other treble heavy instruments. With that said, one of this will do just fine with an acoustic guitar with some tweaking involved. A classing and timeless look that fits any environment well. A variety of awesome features, including some fairly rare ones. Great overall performance which makes it a suitable for recording. Lack of a dedicated shock mount is definitely something to consider. Behringer has always been regarded as a brand that deals a lot with the budget segment of the market. While that might be something other brands are trying to hide, Behringer has been around for long enough where they can wear that title as a badge of honor. Their budget segment is great, which is easily proven by Behringer C-1. You are looking at a large diaphragm setup that packs a great capsule, a transformerless FET input and a few other awesome features you don’t generally see in this category. When put to work, C-1 performs quite well even when you put it against the dominating models in this range. All things considered, it is a great choice for beginners. Great style for a price range where aesthetics are ignored. Good build quality in regards to the chassis and XRL jack. Quite impressive performance both with vocals and acoustic instruments. The shock mount that comes with the mic could have been better. Finding a proper condenser on a budget tends to be hard when you have a set array of expectations. Sometimes things work out, which is the case with MXL 2008. This brand is well known for their budget solutions and the way they bring great value for the money. There are various ways MXL 2008 does that. Here are some. For starters it is a very stylish microphone that comes in a hard case complete with a great shock mount. That alone at this price range is quite extraordinary. Then we have the rock solid build quality of the chassis, a decent capsule which guarantees good overall performance and more. When you draw the line, this mic is quite impressive. Good build quality for the price and a decent design. The available attenuation pad and a high pass filter. Good core performance and a precise cardioid pattern. The stand that comes with it is a bit shaky. They say that budget microphones are completely devoid of advanced features or any features at all for that matter. However, it all comes down to looking hard enough. 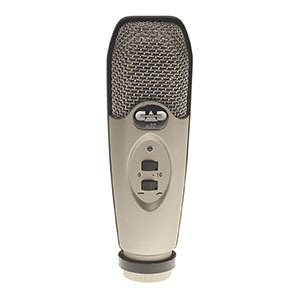 Here we have what is easily one of the most inexpensive mics on the market. Yet this CAD U37 comes packed with features. Not only that, but it brings great core hardware. With a proper chassis protecting a large diaphragm capsule, CAD U37 is no joke. On its own, it works rather well and its cardioid pattern is accurate enough for most applications where you’d want to use this thing. However, it all becomes much more interesting when you add the -10dB pad and a high pass filter. It’s a competitive package. A great set of core hardware components makes it reliable. Fairly robust nature allows it to sustain heavier work schedules. A great set of accessories which really make life easier. Overall great performance considering the price of the while package. Gold plated elements of the chassis come across as tacky. Even though the budget segment is quite limited in many ways, everyone still focuses mostly on big name brands. While this often leads to good choices, sometimes we’re missing some pretty amazing but less popular mics. Neewer NW-500 is one such mic. This bad boy comes with a whole assortment of accessories which only add to an already great performance. The mic itself packs a pretty decent capsule and a proper diaphragm. The chassis is definitely modeled after a more vintage class of condenser mics, which explains the golden color of the birdcage and protective. mesh. Where this package really excels is the fact that it comes with a proper boom arm, shock mount and a pop filter to boot. An abundance of accessories which are had to beat. Decent build quality all around makes this a durable set. A fairly decent performance all things considered. As expected the preamp isn't too great but it works. Getting started on a budget is tough but it is made significantly easier by packages such as the TONOR Pro. What we have here is truly impressive. You are getting a reasonably good large diaphragm condenser, a well fitting shock mount as well as a boom arm and a pop filter. A pretty awesome deal, right? But wait, there’s more. TONOR went on and included a standalone preamp which supplies your mic with the necessary phantom power, as well as a set of necessary cables. If you needed something that would get you started right this moment, this is probably as good as it gets in this particular price range. TONOR Pro set is a great way to start learning. Super compact design which features a built in clip. Durable little mic that can take the abuse. Great performance with awesome features makes it an obvious choice. Not the best tool to record instruments with. Samson really is a brand you can trust when it comes to solid yet portable solutions. Their Samson Go Mic isn’t exactly what you’d expect a condenser to be, but it is a great piece of gear nonetheless. The first thing you need to know is that this thing is tiny which works when need to record on the go. That makes it decent. What makes it great is the fact that it comes with two polar patterns available as well as a -10dB pad. 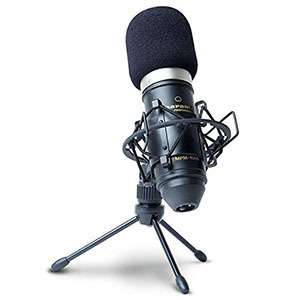 When it comes to recording voice for podcasts or interviews, you simply won’t find a better model in this price range. 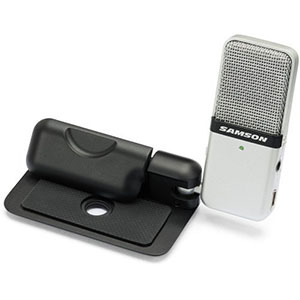 Samson Go Mic does it all and it does it better than its competition. A truly inexpensive entry level model that works well. A good design which offers decent durability and consistency. 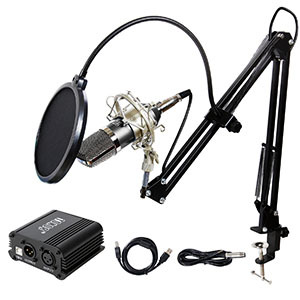 Accessories which include a mount and a pop filter. The polar pattern can be hard to work with. 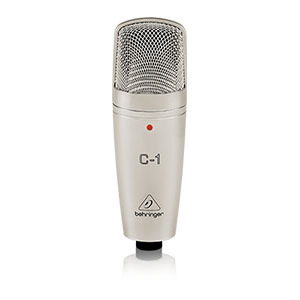 The current budget market segment for condenser microphones is opening up more and more to builds from China. Here we have a pretty convincing package that comes at a very attractive price. However, cheap isn’t necessarily bad, not anymore. ZINGYOU ZY-801 actually delivers a fairly convincing and decent performance which makes it attractive for beginners and for a good reason. With ZY-801, you can learn the ropes of recording on something that is in all honesty borderline disposable. On top of that, the core hardware that comes in this mic is fairly good, all things considered. The sound quality is decent although the polar pattern isn’t the most accurate one out there. Either way, this mic is worth checking out. One of the most affordable options that still work well. A sturdy chassis and a proper tripod mount inspire confidence. Easy to pair with various devices and operating systems. The lack of finesse makes it hard to record vocals. Fifine 669B represents what is available when you are extremely limited with your budget. 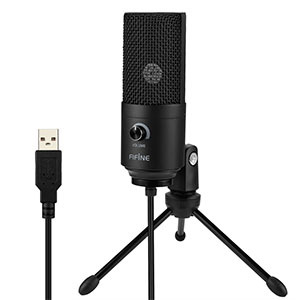 This is a USB condenser microphone that will get you the core performance you need at a price that’s hard to resist. What’s the catch? It isn’t as precise as some people would like it to be. Because of this it’s a great model for beginners. You are looking at a pretty solid chassis that features a semi exposed capsule which is really our only gripe. The mic itself works fairly well and offers plenty of volume. Recording vocals is absolutely possible but this mic is definitely more suitable for dealing with acoustic instruments. It simply lacks the finesse to properly represent vocals on a recording. Are $50 Condensers Worth It? One of the most logical questions people have about these particular microphones is whether or not they are worth the money? The logic behind this being that extremely cheap microphones simply aren’t too much better than a gimmick at best. As it turns out, these condensers are pretty legit in terms of what they can do. Naturally, it is important to stay realistic when it comes to what you can and can not do with a $50 microphone. If you can do that, chances are that you will find these models to be quite interesting to say the least. One scenario where a $50 condenser is really the best you can get is when you are just getting into music recording. Since a condensers can be quite touchy depending on how you use them, being able to learn on an inexpensive models pays off. All of the experiences gathered in the process are definitely applicable to the much more expensive models. Ask yourself, would you want to forge your skill on a $50 unit or a top tier $500 condenser? It is pretty self explanatory. As we have mentioned before, being able to understand the limitations of budget condensers is crucial if you are to have a good experience with one. Fortunately for us, the limitations most users are going to run into aren’t that severe. With that said, we can divide these into limitations that have to do with features and those that have to do with any particular brand’s choice of hardware. As it turns out, if you know how to navigate your way through this, you can end up with a very respectable piece of equipment. To be completely honest, when someone talks about a budget condensers, they are generally talking about a model that costs around $100 dollars. These are great mics which you can read about in our dedicated guide for that price range . However, the issues which we are about to talk about apply to them as well as they do to the $50 price range. For starters these mics come with a bare bone setup. In other words you have a simple diaphragm capsule sitting inside a protective cage. On its own, there is nothing really wrong with this setup. However, you are lacking things such as advanced internal suspension, advanced capsule design and so forth. None of these are crucial in a sense that the mic won’t work without them, but their absence can severely limit the quality threshold you can reach with your equipment. Further more we have the lack of advanced recording patterns. The deal with condenser microphones is that they tend to be rather directional. With multiple patterns, not only can you choose which areas of the room you want to record, but you have a lot more freedom when it comes to recording various instruments. Almost all budget models will have the standard cardioid pattern and not much more. Again, this isn’t a super crucial feature but it does make life easier. This one is fairly obvious but still needs to be emphasized. When we say build quality, we don’t mean that you should look for all metal designs even though those are definitely great if done right. We mean that you should look for mics which are put together well. Believe it or not, there are microphones out there which feature an all metal body which can’t even be compared to certain composite chassis designs which exist out there. While materials are a good sign of quality, they most definitely are not a guarantee. Good specs are always a reassuring sign. If a microphone brings a good frequency response range, has a decent impedance and packs a fairly large diaphragm, you can tell that it will most likely sound pretty good. One thing we can definitely advise you to not do is getting too involved in specs. Okay, this may sound a bit contradictory on our part but there’s logic in our argument. A good spec sheet means a lot, but it’s not something you should solely base your decision on. Be mindful of other factors as well. If there is one thing this article should convey at the end of the day, it is that budget condensers definitely have a place in today’s world of music production and entertainment. The models listed above are easily some of the best you can find for this kind of money. If we had to choose one, we would say that Marantz Professional MPM-1000 represents the best bang for the buck. This mic is so well rounded and comes with a great set of accessories. It is a great place to start if you’re just getting into condensers as a whole.